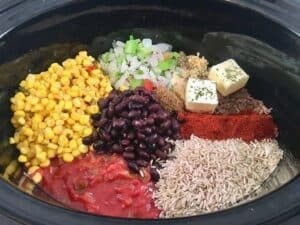 Crock Pot Mexican Casserole is an easy meal packed with flavor and loaded with ingredients such as corn, black beans, salsa, and rice. Simply cook the ground beef then add the remaining ingredients to your slow cooker. Quick Note: This post contains affiliate links which mean if you make a purchase through one of these links, I may make a small commission, at no cost to you. Please read my disclosure statement for details. Thank you. Everybody has their favorite version of Mexican rice casserole. This one is our favorite because it’s full of flavor and always turns out perfect. It’s versatile, too. Everybody can add their own toppings so everybody is perfectly pleased. Making this for Cinco de Mayo is a tradition but any day is a great day for making this easy Mexican dinner recipe! And it qualifies for a Taco Tuesday meal. 1. Brown the ground beef and drain. Add to your crock pot. 2. Add remaining ingredients (except the lime). 4. Spoon into a serving bowl and top with a squeeze of lime. Add more of your favorite toppings such as shredded cheese, sliced avocado, sour cream, green onions, etc. Serve with chips or use as a filling for tortillas. Every time I use the crock pot for my favorite slow cooker recipes, I always ask myself, “why don’t I use this crock pot more often!” I’ve had this crock pot for at least 5 years. It’s not fancy, but I love it. The crock pot, also known as a slow cooker, is simply a magical meal maker! There’s something special and delicious about a meal that’s been slow cooked all day. 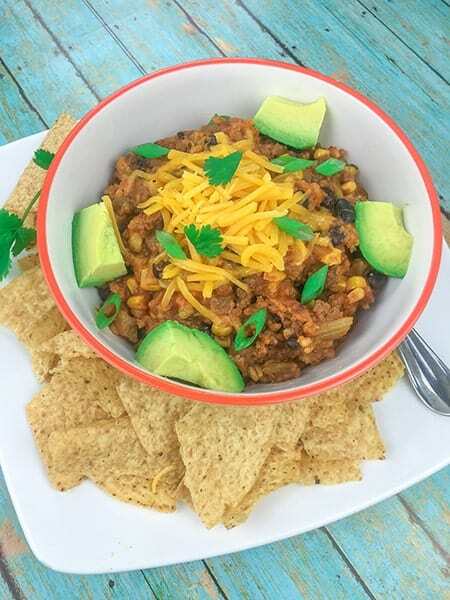 This crock pot Mexican casserole is perfect for an easy meal any day of the week. Here’s the before picture. This recipe uses long grain white rice. You can use brown rice instead but you will likely need to let this cook longer, perhaps as much as one additional hour, so please adjust the time as needed. I like to use salsa instead of canned tomatoes for this recipe. Why? Flavor! Salsa has much more flavor than canned tomatoes. Plus, you can choose your spice level. Use mild, medium, or hot salsa. Use whatever suits your tastebuds! We use Southwest Whole Kernel Corn with Pablano and Red Peppers. Why? I’ll give you 3 guesses! If you guessed it’s because this corn has more flavor than plain whole kernel corn, then you are correct! I like to take every opportunity to add more flavor to a meal. Bland is for the birds! Have you tried the frozen chopped onion, bell pepper, and celery blend? I tell you that this stuff is the only way for me. Once I discovered this, I have yet to chop another onion (and I have not shed any tears since!). Some people may gawk at the idea of using this, but if fresh onions and bell peppers are your thing, then continue to chop, chop, chop. Fresh is better, I won’t even try to convince you otherwise. But in my world, the pre-chopped, frozen version works for me! Now, you can enjoy this Mexican casserole as is, right out of the crock pot when it’s done. Spoon it into a bowl, add a squeeze of fresh lime juice and some shredded cheese and enjoy. Add some avocado and sour cream and you’re good to go. 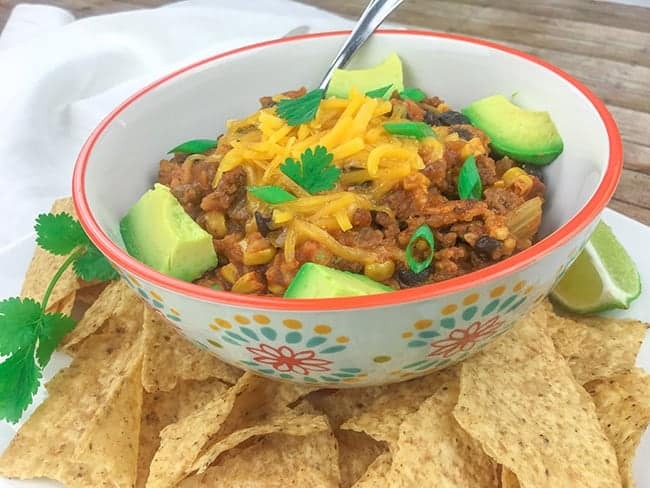 Some people have been known to eat this casserole with tortilla chips or corn chips. Try it inside a taco shell. Others have used this casserole as a filling for their wraps. I’m always interested to hear how creative people can be with food! This is truly an easy dinner meal. Now, let’s get crocking! 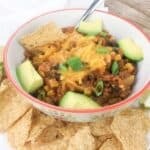 This Crock Pot Mexican Rice Casserole is packed with flavor and loaded with ingredients such as corn, black beans, salsa, and rice. Simply cook the ground beef and add the remaining ingredients to your slow cooker. Turn the crock pot on and let it do its magic. Your favorite toppings of choice: a few drops of fresh lime juice, shredded cheese, avocado, sour cream, greek yogurt, guacamole, lettuce, tomato, etc. Brown the ground beef and drain. Add to slow cooker. Add remaining ingredients to the slow cooker. Mix well. Cook on high for 3 hours or low for 4-5 hours or until rice is cooked. 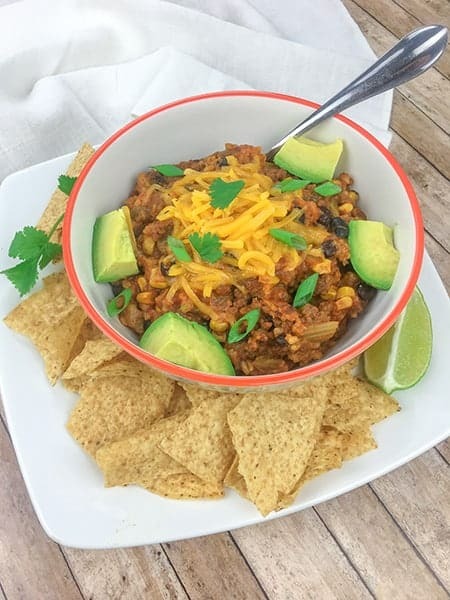 Top with your favorite items such as a squeeze of fresh lime, chopped cilantro, avocado, shredded cheese, green onions, sour cream, lettuce, tomato, etc. Eat with tortilla chips or corn chips. NOTES: (1) You can use cooked ground turkey, cooked ground chicken, or cooked chopped or shredded chicken instead of the cooked ground beef. (2) I like to use the frozen seasoning blend to save myself some chopping time. However, you can use fresh bell pepper, onion, and celery if you desire. I would use 1 cup chopped fresh onion, 1 cup chopped fresh bell pepper, and 1/2 cup chopped fresh celery. (3) If you plan to use brown rice instead of white rice, you'll probably need to cook it longer. Perhaps as much as one hour longer using brown rice. If you try this recipe, leave me a comment and let me know how it turned out. I’d love to hear from you.